Rather than reaping the benefits of mineral wealth, scheduled tribes are victims of displacement disproportionately more often than others. A recent report titled the ‘The Legal Regime and Political Economy of Land Rights Of Scheduled Tribes in the Scheduled Areas of India’, brought out by the Centre for Policy Research Land Rights Initiative (CPRLRI), New Delhi, and authored by Namita Wahi and Ankit Bhatia, has revealed that while almost 89% of all mineral wealth generated in India comes from schedule areas, this wealth is not channelled appropriately for the benefit of tribal peoples. The report, released in New Delhi on March 15, has found this especially worrisome in the context of huge shortfalls in recommended financial allocations for the welfare of Scheduled Tribes (STs) under the tribal sub-plan. Articles 244 (1) and (2) of the constitution carve out tribal-majority areas from the geographical land mass of India, designated as scheduled areas in the fifth and sixth schedules of the constitution, respectively. Here, the STs are unique because unlike the rest of the population and even the Scheduled Castes, who have group-based representation and affirmative action provisions, the STs are the only minority group that have specially-recognised rights to land. The fifth schedule provides for the administration of tribal-majority areas in ten states within peninsular India that have tribal minority populations, that is the population of STs is in a minority compared to the population of the remainder of the state. The current fifth scheduled areas are in the states of Andhra Pradesh, Telangana, Gujarat, Jharkhand, Chhattisgarh, Himachal Pradesh, Madhya Pradesh, Maharashtra, Odisha and Rajasthan. The sixth schedule provides the broad framework for the administration of tribal areas in the north-eastern states of Assam, Meghalaya, Tripura and Mizoram. Two of these states, Meghalaya and Mizoram, are tribal-majority states, whereas Assam and Tripura are tribal-minority states. The sixth schedule envisages the creation of autonomous districts and autonomous regions (within the districts) to be administered democratically by the indigenous tribal populations of such scheduled areas as opposed to the state legislatures. Meghalaya is the only state in the country where the president has declared the entire state as a sixth schedule area. Together, the fifth and sixth schedules provide the protective framework to empower STs to engage effectively with the more “mainstream” society without fear of exploitation. The CPRLRI team has found that STs have disproportionately borne the burden of economic development because of displacement, caused by their special relation to land which other groups do not have. Poverty and landlessness are rampant among STs. 9.4% of all STs are landless as compared to 7.8 % for the national average, and 47.1% of all STs are below the poverty line in rural areas as compared to 33.8% for the national average. Even though STs constitute 8.6% of the total population today, it is estimated that they constitute 41% of the people who have been displaced between 1951 and 1990 due to the construction of dams, mines, industrial development and the creation of wildlife parks and sanctuaries. And yet, statistical evidence to document the correlation between dams, mining and other forms of economic activity with the displacement of STs does not exist. Displacement not only makes these groups economically vulnerable, it threatens to destroy their cultural identity. There is very little that has been written about the scheduled areas or the specialised relationship between STs and these areas. We do not even know how much of India’s geographical land is in the scheduled areas. Why have STs been increasingly marginalised by the processes of economic development? The answer, perhaps, lies in the data, which has been painstakingly collated by the CPRLRI team. Out of 640 administrative districts in India, a total of 123 districts have listed scheduled areas. Of these districts, 104 districts have fifth schedule and 19 districts have sixth schedule areas. In the 123 districts, 51 districts are those where the entire district has been declared a scheduled area: 36 under the fifth schedule and 15 under the sixth schedule. The percentage of scheduled area vis-à-vis total geographical area in the country is 13% (11.3% under the fifth schedule and 1.7% under the sixth schedule). The population living in scheduled areas accounts for 6.3% of India’s total population. This includes both the ST and non-ST population, and doesn’t include information on Andhra Pradesh and Tripura as the scheduled area boundaries of these states could not be mapped with the latest administrative codes. For the remaining scheduled area states, on average, only about 39% of the total ST population is residing in scheduled areas. On average, 53% of the population in fifth scheduled areas is ST, whereas 60% of the population in sixth schedule areas is ST. The constituent assembly demarcated scheduled areas as tribal-majority regions. But, it is abundantly clear that many of the designated tribal-majority areas, especially those in Maharashtra and Telangana, are, in fact, tribal-minority areas. This seems to confirm the widespread belief that STs have been either voluntarily or involuntarily displaced from scheduled areas. Dams are widely believed to be one of the biggest causes of displacement of STs, but the veracity of this claim has never been established. The report seeks to identify the distribution of dams in scheduled areas vis-à-vis the distribution of such dams in the non-scheduled areas. For this purpose, the report relies on the data available with the Water Resource Information Systems (WRIS) and the National Register for Large Dams (NRLD). The WRIS dataset contains information on 4,657 dams, whereas the NRLD dataset contains information on 5,190 dams. The CPRLRI team, through further research and analysis, created a consolidated database of 3,771 large dams and 59 ‘dams of national importance’. This dataset does not contain data on dams that are under construction, reservoirs, tanks, barrages and weirs. The report concludes that 38% of all dams lie within scheduled areas, which implies that the density of dams is 2.5 times higher in these areas. The report has similar findings with regard to mining as the biggest cause of displacement of tribals. Finding that systematic data on the extent of mining activity in scheduled areas and the distribution of revenue generated from such mining activity amongst different beneficiaries – the government, mining companies and the tribal population – is conspicuous by its absence, the team sought to create such data using the Union Ministry of Mines’ annual report, 2016-17. The total number of major mineral reporting mines for 2015-16, it found, was 2,100. 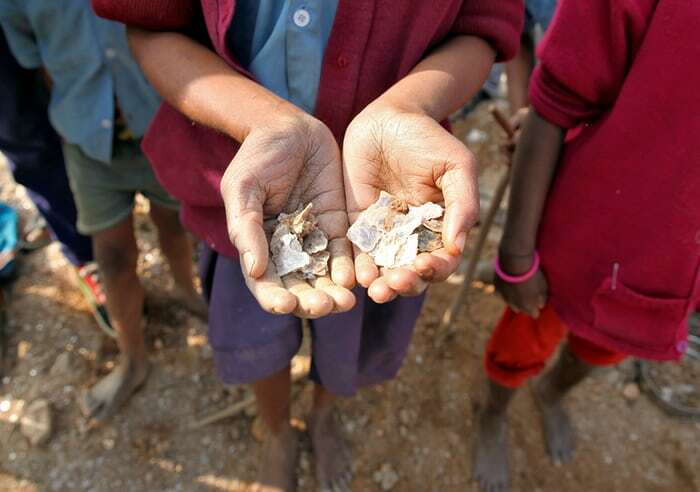 Out of this, 1,463 mines, that is roughly 70%, were in fifth schedule area states. This estimate is excluding the share of Himachal Pradesh, Meghalaya, Mizoram and Tripura, since information for these states was not available. The team deciphered from the information contained in the annual report that the total value of mineral production for the year 2015-16 was Rs 2,76,638 crore. Its analysis of mineral production values reveals that 70% of mines and 65% of mineral production are concentrated in the states that have fifth schedule areas. Royalty accruals from these states are as high as 88.5% of the total royalty accruals in India. The report has found that scheduled area states are bearing the costs of most of the mining activity in the country and contributing to almost 90% of the royalty accruals to the Central and state governments. Twenty-seven of the 50 major mining districts in India are scheduled area districts, the report adds.